Welcome to the Spanish Programs! We also offer a minor in Spanish. We have faculty scholars who teach in all areas of Spanish, including courses in Hispanic Linguistics, Latin American Literatures and Cultural Studies, Pedagogy, Spanish Film, Spanish Literatures and Cultural Studies, and US Latino Studies. This diverse faculty is dedicated to excellence in scholarship, teaching, and community outreach. A wide range of interests reflects the program's diversity in purpose and desire to satisfy a variety of student needs and career goals. 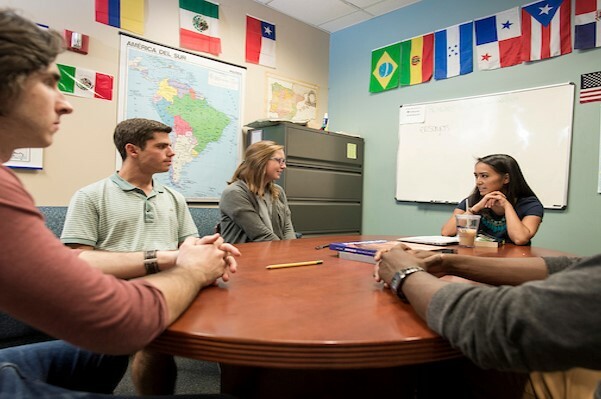 The program's activity beyond the university community is reflected by the partnership with the Cape Fear Foreign Language Collaborative, various faculty-led study abroad programs, internship opportunities in the region and abroad, as well as outreach to public schools and various non-profits in the region. Spanish for Non-Natives for those who grew up speaking a language other than Spanish in their home. Spanish for Bilinguals for those who grew up speaking Spanish (or Spanish and English) in their home. In order to determine which track and course you should enroll in, visit the Placement Tool page for more information.